Oct 27, I checked my Unionbank account online to see my current balance, and to my surprise, this popped-up on my statement of account. The first one “Transfer from Credit Card” was not able to push through for whatever reason, but the second one, deducted me 1493.88php for unknown reasons. I further investigated, and found this. Yes, whoever used my paypal account, ordered these. I was in shock because here I am, wanting to eat pizza, and he got it for free! I used the Dispute a Transaction button found under “Resolution Center” and followed through the steps. I was planning to call Paypal but they only had international numbers I am not capable of calling. I was not bringing my hopes up due to this. A friend suggested we should call Shakey’s and ask about what had happened. Lucky him, he was able to get to their number while I only had a continuous busy tone. To cut the story short, after giving details, Shakeys would not give any information about the person who was able to use my Paypal account to transact. My friend was asked to call the bank involved to ask about what I was supposed to do. Which I did the next day after. Talking to Unionbank’s CSR, I was asked several details for verification, I told them Shakey’s would not give any information about the person. I was told they were supposed to since it was my card involved in the situation. Anyway, after some discussion with their representative, I was asked to make a letter of dispute to be sent to their e-mail, which of course, I did. Upon reading that, I decided not to pursue my complain. It’s too much hassle and it takes too long. I hoped and checked my account everyday since then. Nov. 5, I found this. Checking my Paypal account history, The transaction was reversed and I was refunded the amount that was gone. I actually did not expect that one to come along but it’s nice to know they are actually doing something. I don’t know if Unionbank has something to do with the refund, but given the things they wanted me to do, I think not. But at least, Paypal did something to fix the issue, and quite fast as well. So I posted here in case someone encounters the same and do not know what to do. I know this is a rather old anecdote but i *just* got hit for $3000 by a slew of fraudulent payapl transactions. Reading what you wrote gives me some hope since i just got an email about the refund a few hours ago. I’ll have to keep checking my account as you did. Ohhh. I’m sorry to hear that. I hope you get your money back soon! I find this helpful. and i am really hoping that it will also happen to me (the refund thing) I just made a purchase from Lazada worth 6k with Paypal linked to my unionbank epaycard. 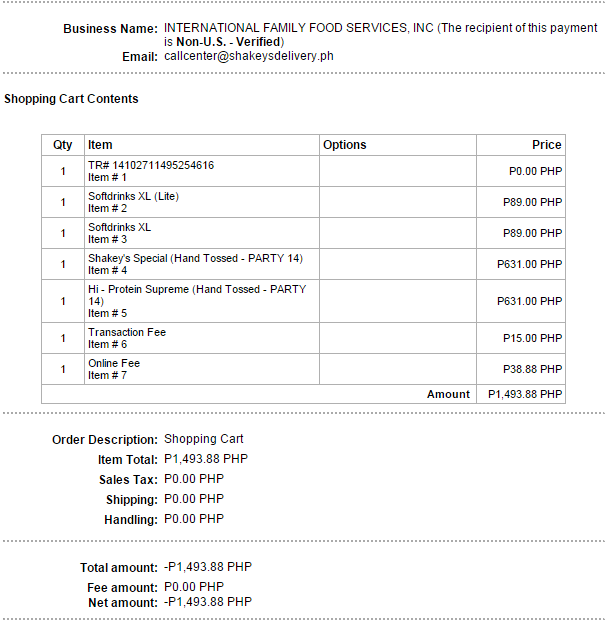 and to my surprise, the order was cancelled eventhough i have available funds. i literally cried. I filed a dispute thru the options in my paypal acct, and i received the same email from paypal, the amount reflected as REFUNDED on my paypal but im still waiting for the funds to be available on my card. this happened on April 12, 2017. they told me it should be on my card in 2-5business days. btw, i called unionbank and they want me to file dispute that would take upto 85 banking days. I think i will just wait for 5business days. Clearing from our local banks really take a while. really hope you get your funds back!